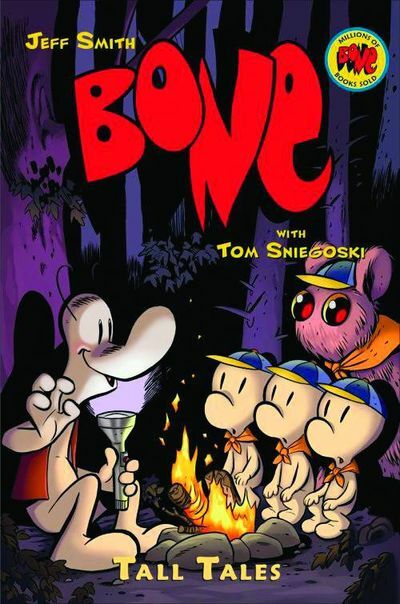 Bone: Tall Tales by Tom Sniegowski and Jeff Smith. Published by Scholastic Books. I have to admit that I have a bit of a 4 minute hate for people who buy comics only because a character they love is in them: “WOLVERINE TOUGH! ME BUY BOOK! ” Ugh. But yay, since that’s a big part of the modern superhero-comic industry. Don’t get me wrong, I get liking a character. But buying all of that character’s appearances regardless of quality makes no sense to me. There’s just way too many GREAT comics out there to limit yourself like that. There are exceptions to this of course, and they mostly hinge on the character’s creator being involved somehow: Eric Powell’s Goon, Mike Mignola’s Hellboy, etc. Which brings us to Jeff’s Smith’s Bone. Anybody who I owe money to knows that I consider Bone to be one of the greatest comic books ever created. It’s a fantasy epic masterpiece that I rank among things like Lord Of the Rings, His Dark Materials, and Chronicles Of Narnia. And so the idea of NEW Bone material gets me giddy with geek joy, but also worries me: Bone is perfect, and as such needs no extra filler. Jeff Smith & Tom Sniegowski recognize this, and focus on expanding the peripheral characters of Bone rather than attempting to expand the plot. Tall Tales consists of a newly colourized version of one previously published Big Johnson Bone story, plus a few other new stories, loosely based around the idea of Smiley Bone and Bartelby telling a group of young scouts stories about Big Johnson Bone, a legendary figure in Bone’s mythology. The main story here was previously published in black & white as Stupid Stupid Rat-Tails, but everything else is new. The stories here have a similar lightness of tone to the Bone series, but without the emotional resonance of that series. These stories are exactly what they say they are: tall tales, and such aren’t to be taken too seriously. They’re fun, and a great read IF you’re a big fan of the world Jeff Smith has created. I’d recommend this for parents looking for something fun for their kids, and for Bone completists. Bayou by Jeremy Love. Published by Zuda/DC comics. I’m not really sure how I missed Zuda comics. I mean, I didn’t completely miss them. I knew of it’s existence. But since I don’t find it enjoyable to read comics on my computer, I passed on DC comic’s attempts to revolutionize webcomics. However, since the introduction of Comixology’s app for iPod Touch and Phone, I’ve tried quite a few web comics in recent months, and ironically it’s sending me out to buy them in print form when they come available. 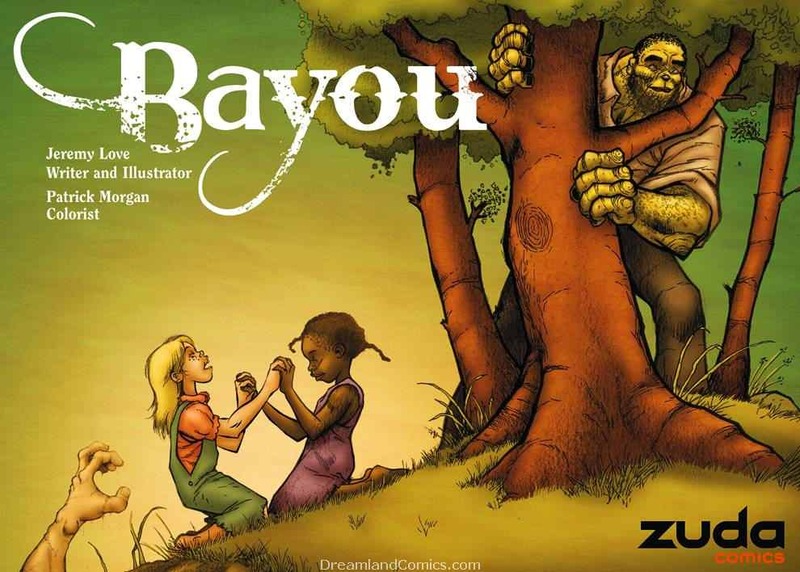 Bayou is one of my recent discoveries, which is a little sad since Zuda as originally conceived is no more, and it’s one that I’m kicking myself for not getting into earlier. Bayou is the story of Lee Wagstaff, the daughter of a sharcropper in an alternate version of 1930’s Mississippi. This world isn’t much different than the one we know, but it’s one that’s deeply steeped in American mythology. This world has monsters. Some of them, like racism, hatred, and intolerance, will be very famliar to us. But others, like the amiable blues singing Bayou, or the evil swamp creature known as Bog, are a little stranger, but no less terrifying. Lee’s friend Lily has been taken, and the central arc here is Lily’s attempts to find her, not just for her sake, but for that of Lee’s father, who is on the verge of being unjustly lynched for Lily’s kidknapping. Bayou is pure magic. It’s a testament to the creativity of comic books. A compelling narrative, weirdly stunning art, and a reminder that the real monsters we face are just as terrifying as the ones we can come up with in our heads. Movie Review: Vancouver International Film Festival – Pretension Abounds!